Note to self: Dyeing takes at least twice as long as you originally planned, so be prepared! Yes, I’ve had another long day in the kitchen. All I wanted to dye was the Rebecca yarn. The dye bottle was supposed to dye two pounds of fiber. I have a pound and a half of yarn. The instruction sheet for Jacquard dyes recommends a half bottle of dye per pound of fabric. 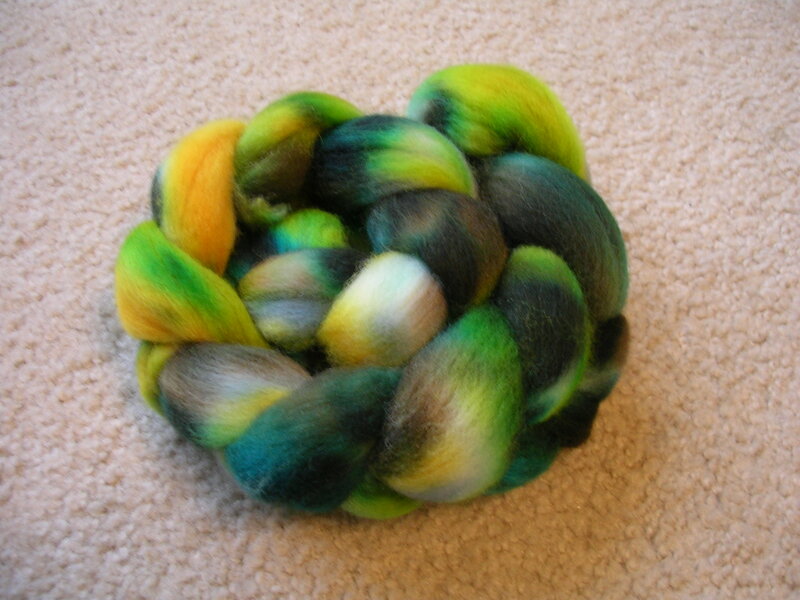 I decided to play things safe and put in a half bottle of dye for the pound and a half of fiber. Well, the yarn turned the color I wanted before the solution even got heated up! Right There! I Can See It! Look what is showing through my once-enormous pile of turquoise fiber. This is all I was able to make before running out of purple locks to stick into the thin single. Actually, I’m rather glad I ran out. It was getting a little tiring. I have a few chunks of badly felted locks left, but they don’t look as pretty as the ones in the yarn. That enormous skein on the end was what I got done yesterday. Oh, by the way, all the stuff you’re seeing here are things I got done yesterday. It was late when I got around to winding things down, so I didn’t get this up until now. I shall try to be better about that. Oh, and if you’re wondering about the twins, I didn’t want to wind off an entire spindle full, so my dad made me a second one and I spun the other half of the fiber on that. 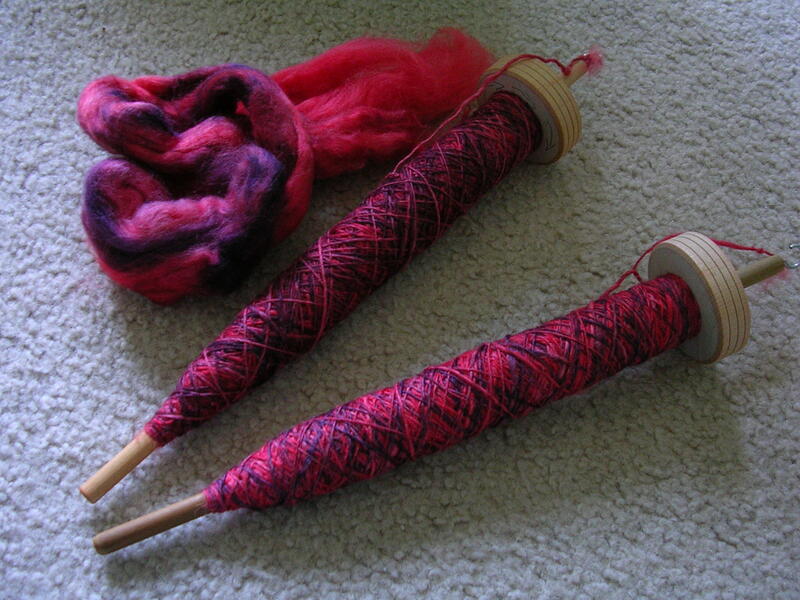 An extra spindle is a very handy thing. While I was juggling the previous two skeins of yarn, I went ahead and dyed two batches of roving in the oven. Here’s the first one. It’s basically a second batch of the “Heather” colorway I did earlier in Thistles and Heather. I used brighter primaries for this one, so the colors are a little bolder. 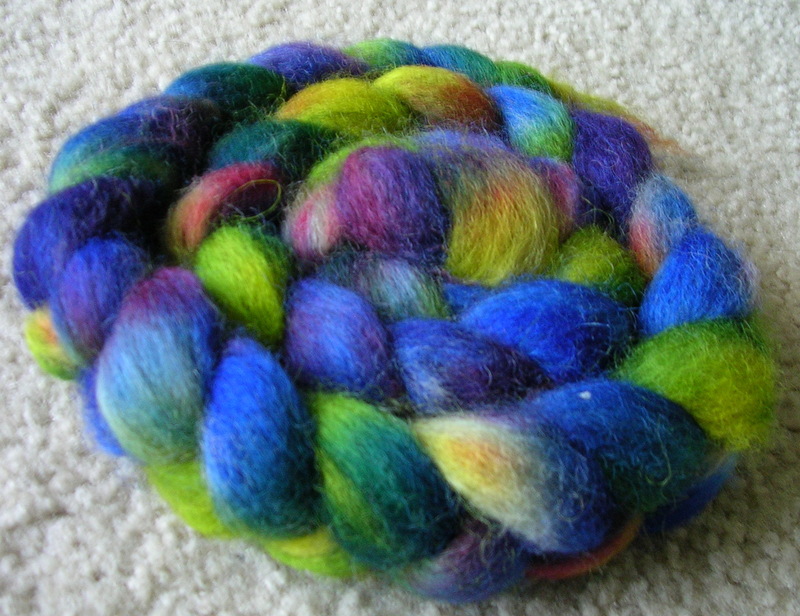 The roving is the same Romney mix I used for the first batch. I had to dig really deep into my stash to find it. All the recent purchases sort of got piled on top of it. I had some extra dyes left over from the supposedly fall colorway and I didn’t want to waste them. Some roving was soaking and ready to go, so I grabbed one of them and started pouring. The final product is very much like a little tree frog! The first place I bought wool from I had stopped to look at an overflowing basket of gorgeous, shiny, curly, white wool locks. Next thing I knew the owner was right next to me. She was such a nice lady, and she told me all about the Wensleydale sheep she has (Wensleydales are native to England) and how nice their fleece is. Believe me, you could see how nice the fleeces were. All it took was one touch.